Liverpudlian Sausage Ingrate bemoans holiday sausage surprise! Naked Butcher Lands at #4 on the Wall of Sausage Shame! Man loses 14 pounds in October by sticking to a Beer and Sausage diet. Toronto Sausage Smuggler places #3 on the Wall of Sausage Shame! Stop by Billy's Brat Stand for sausage rants, ramblings and diatribes by Billy Bratzenbier, Sausagefest's roving/raving editor! Sausage Alert: Sausagefest Travel Warning: Bradford, England! Click for details! Join Kent on the sausage trail! Check out our new Sausage Trail Reports page. Visit the Sausage Storage archive for past reviews of Sausagefest. 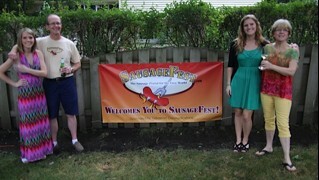 Thanks for visiting Sausagefest.com, the Sausage Portal For The Free World! 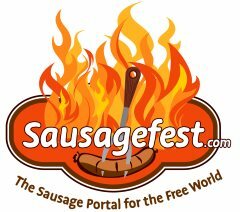 Support Sausagefest by clicking our sponsor ads and links! We thank our friends at KelmscottEDU for supporting Sausagefest through the years! Interested in advertising on Sausagefest.com? The latest "sausage news" from Google News! Cabo San Lucas is at the tip of the second longest peninsula in the world, the Baja California peninsula of Mexico. Despite what you may have heard, Sam Hagar didn’t discover Cabo. Cabo has many magnets. The whale watching is superb. The seafood and dining choices are first rate. The contrast between the blue of the ocean and the desert is stunning. And, the local residents make you feel welcomed. On this trip our main focus was whale watching and relaxation. But, since Sausagefest never sleeps, we wanted to pass on some new finds while we were in Cabo. Our home base was the Las Ventanas al Paraiso resort on the Sea of Cortez side of the peninsula. Fabrice Guisset is the Executive Chef there and a great ambassador for the hotel and the local cuisine. A trained French chef in a seaside resort is a dangerous combination – but in a very good way. He graciously shared with us one of his recipes that marry local seafood with sausage – Dark Beer Steamed Mussels with Chistorra (see our recipe page for this). Chistorra is a pork-based sausage of Basque origin. Small in diameter its length can be one to three feet in length. The Chistorra we had in Cabo was the Mexican version. Which meant that the paprika of the Basque version was absent. Instead of the paprika there was chili pepper added. This New World version is worth seeking out and trying. When you think Chiorra think of it like a better breakfast sausage alternative. Except, Chistorra can also be found as a tapas bar treat – its more than a breakfast staple. On a Tuesday morning at the Ocean Grill Fabrice treated me to a Chistorra tasting with French and Mayan touches. Accompanying the Chistorra was Fougasse. Being French, Fabrice took this bread from Provence, added some olive oil, and cooked it in the adobe oven with the sausage. Let this mixture set in a bowl for at least an hour; stir occasionally. For those more adventurous you might want to use a whole habanero pepper, but also double the onion and lime ingredients. What does the “dog’s nose” have to do with the salsa? Common conjecture is that your nose will run like that of a dog. A graphic and sobering image – enough said. As always, take care with working with the Habanero pepper. Gloves for your hands and eye shield are worth investing in. That cautionary note aside, this is a simple but amazingly good salsa. Teamed with the Fougasse and Chistorra this is a breakfast meal that will quickly wake up your taste buds. The Las Ventanas al Paraiso resort is part of the Rosewood group of fine hotels and resorts. Its one of those high quality, high personal service hotels. It also has a tequila – sushi bar on the premises that also requires a visit. Click here for more information about Las Ventanas al Paraiso.